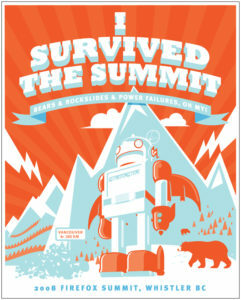 It’s been well-documented that this year’s Mozilla Summit was a fairly eventful week, what with a highway-blocking rock slide, bear sightings and a half-day power outage on top of the talks, sessions, ping pong games, dinners, etc. At the suggestion of Deb Richardson, we decided to immortalize the various dramas by turning them into a laptop sticker. Tim Hogan from the Royal Order was there to experience it all firsthandand was kind enough to translate the excitement into the artwork below (based, of course, on the original design by Nobox). 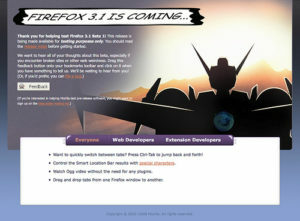 Last month I announced an impromptu contest to see who could come up with the best interpretation of the Firefox 3 Beta 2 ‘robot’ artwork. I have to say, I was both surprised by and impressed with the volume and creativity of your comments. There were certainly a lot of great ones. It took me a little longer than planned to determine the winners, but I’m pleased to report that after much careful deliberation, I have the results. Before I go any further, though, let me make it clear that these are not the “right” answers. There is no single “right” answer…it’s all just a matter of highly subjective interpretation, and these were the three that struck me the most (and won the t-shirts). Thanks to everybody who participated…this was a lot of fun. And will we see the robot again in the future? Stay tuned!